New Delhi : The government today said it has paid 89 per cent of wages to workers under the MGNREGA scheme within 15 days of the work done. 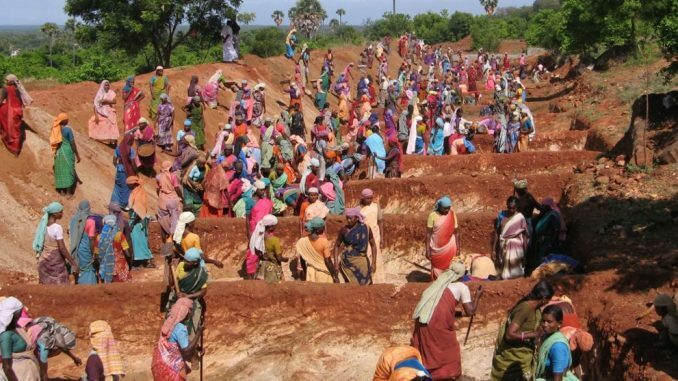 Timely payment of wages under Mahatma Gandhi National Rural Employment Guarantee Act (MGNREGA) has been a major concern for government from some time. Union Rural Development Ministry in partnership with the state government has been trying to ensure timely payment of wages to the MGNREGA workers. “In the current financial year, 20.88 crore person days of work has been generated so far. 89.08 per cent of wage payments have been made within 15 days of work done,” Rural Development Ministry said in a statement. 22 states including Puducherry received wage payment directly through National Electronic Fund Management System. The Centre along with states is working on direct transfer of wages into the bank accounts of the workers. Over 85 per cent of active MGNREGA workers have their Aadhaar details seeded with their consent and 4.85 crores workers are already on the Aadhaar payment bridge linked Bank accounts, it added. The thrust of the MGNREGA is on water conservation and sates have adopted mission water conservation guidelines to focus on 2,264 water stressed and irrigation deficient blocks of the country. Emphasising on the asset creation, the ministry is making all efforts to create durable assets and provide employment on demand.